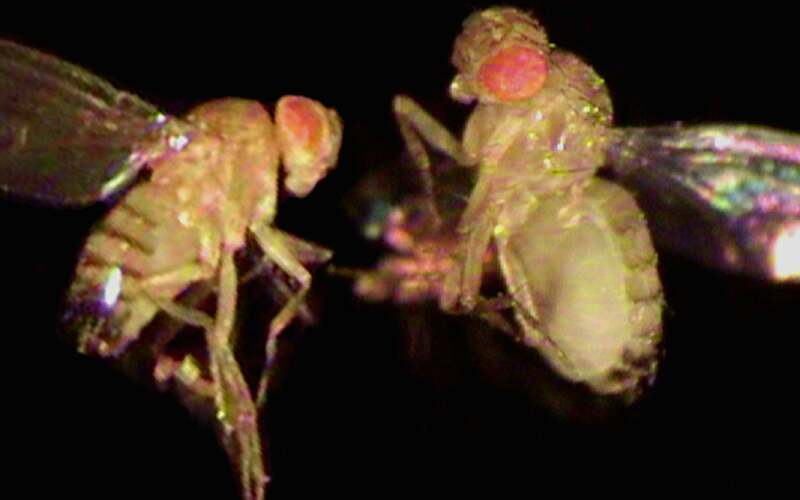 Researchers have created the first model of genetically induced obesity in fruit flies. The overweight fly (the fly on the right in this image) can be used to study ways to dodge adverse health effects triggered by the perfect storm of genetic predisposition to obesity and calorie-rich, nutrient-poor diets. The fruit fly sheds light on how the brain acts to signal “fullness” and suggests the possibility of conferring resilience against the impact of high-fat diets. Cold Spring Harbor, NY — Why do people become obese? Poor dietary choices and overeating seem like clear causes, but what is at the root of these behaviors? Significantly overweight people may be genetically predisposed to be affected disproportionately when faced with the ready availability of calorie-laden treats. It appears, in others words, that some people’s genes place them at particular risk of gaining more weight than others in the modern food landscape. Scientists at Cold Spring Harbor Laboratory (CSHL) today report in Cell Metabolism that they have created the first model of genetically induced obesity in fruit flies. The model can be used to study ways to dodge adverse health effects triggered by the perfect storm of genetic predisposition to obesity and calorie-rich, nutrient-poor diets. To create the fly model, the researchers manipulated a neural circuit in the fly that they have discovered is strikingly similar to one that exists in people and other mammals. Lead investigator Jen Beshel, Ph.D., who conducted the experiments while performing postdoctoral research in the laboratories of Yi Zhong, Ph.D. and Josh Dubnau, Ph.D., explains that a hormone in the fly, called unpaired 1, performs the same function as the hormone leptin in people: After its release from cells, it docks with receptors in the brain to tell the body to stop eating. Leptin is the famous dispatcher of what scientists call the “satiety” signal—the one that tells you you’re full. The idea of therapeutically administering leptin to obese people to overcome a genetically induced failure of leptin signaling emerged from research in mice first conducted at Rockefeller University in the 1990s. Beshel’s research breaks new ground. Most leptin studies to date, she notes, have focused on leptin that is released from mammalian adipose tissue, i.e., fat cells located throughout the body. Following its release, the hormone makes its way across the blood-brain barrier, where it docks with receptors on nerve cells in the hypothalamus. Unpaired 1, the leptin-like satiety hormone in the fly, is generated not in fat tissue but locally, in the fly brain. There, according to Beshel, it docks at fly-brain receptors called Domeless—analogous to the leptin receptor in the mammalian brain. These fly Domeless receptors are very similar to those found in mammals—so similar that they can be activated by human leptin. This fact led to the subsequent discovery of unpaired 1, the hormone native to the fly that performs this satiety signaling function. Beshel also used genetic manipulation to subtract the Domeless receptors in a specific subset of neurons that are the target of unpaired 1, called NPF-expressing cells. These are the equivalent of NPY-expressing cells in mammals. In flies, NPF cells express a protein fragment called neuropeptide F (just as in mammals, NPY cells express neuropeptide Y). NPF in flies, like NPY in people, turns out to be a major regulator of eating behavior. In prior mammalian research, it has been shown that when leptin docks at receptors in the hypothalamus, it inhibits the activity of NPY-expressing cells. Beshel shows that the circuit in flies consisting of unpaired 1, Domeless, and NPF works in the same way. The circuit has been conserved over eons of evolutionary time, despite the vast differences between flies and humans. “Now that we’ve established this fly model, we can look forward to performing thousands of genetic manipulations on this neural circuit, to see what might regulate the release of the leptin analog, unpaired 1,” Beshel says. This is intriguing because leptin is the most-studied signal regulating the neural circuits controlling energy balance and hunger in mammals, yet the basic mechanisms determining how it is made and what controls its release remain largely unknown. With the discovery of such a similar system in the experimentally tractable fly, says Beshel, “the hope is that answers to such questions can be fast-tracked. There are long-running debates about the relative contributions of genetics and environment in human obesity.” Beshel speculates that underlying genetic differences might make some people much more sensitive to the type of changes in the Western diet that have occurred over the last 50 or more years. People with a genetic predisposition would gain much more weight when on a bad diet than others without such a genetic predisposition (although they too would gain weight). This is true of Beshel’s plus-sized flies: when placed side-by-side with flies lacking problems in unpaired 1-domeless-NPY signaling, the flies with the genetic condition gained much more weight when given access to abundant food sources rich in sugar and fat. “Our goal with the fly system is to quickly screen through thousands of different candidates for things that might, for example, confer resiliency in the presence of high-fat food,” says Beshel. The research discussed here was supported by NIH—the National Institute of Deafness and Other Communication Disorders (R01 DC013071).